Come enjoy a flight experience in a historic WWII era plane and learn about Canada’s contribution to the Allied victory through the British Commonwealth Air Training Plan. 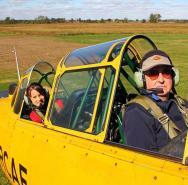 Located at Tillsonburg Airport in the heart of Ontario’s Southwest, CHAA holds several Fly Days each year and participates in air shows where crowds experience the thrill of the distinctive roar of the Harvards flying in formation. Tour the restoration hangars and learn how these planes are restored to their former glory. Open Tuesdays and Saturdays 9:00 to 3:00. A great outing for the entire family. Prepare to be amazed!